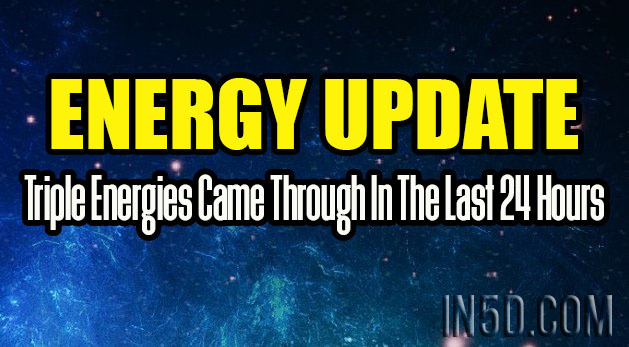 Triple night or day of energies came through in the last 24hours! Breaking through old ‘family conditioning’ – Leading up from so much we have broken through or taken ourselves out of a box with (BB post July 1st) – has flowed and followed on to a family ‘situation’ or energy that is no longer relevant or beneficial to be in or ‘hold onto’ anymore. We have grown not only of ourselves but in some way of a family way or ‘tradition or prejudice’ from the past, this is from experiences in this lifetime (which will go back many lifetimes). Now this could be as we have ‘outgrown’ a situation OR we have been or someone has been taken ‘out of our space’ for this to happen as well. This deep DNA cleansing, healing and upgrade has been ‘something else’ on our physical bodies. The purging and releasing has ‘wiped’ many of us, coming up and out in different ways. What started out as a slight migraine and jaw pain for myself then ‘transpired’ into full blown influenza A symptoms being purged and released, hence pulling back recently. This is honoring this physical purge and release from our cells and allowing this up and out in taking various/copious health supplements and acupuncture and herbs and all that is possible to take to support the body and immune system in releasing this. Allowing the body’s immune system to push through this and not ‘jumping’ in fear to take antibiotics – which will suppress this only to arise again in the future. Honoring and knowing how deep this is and that it will take a little ‘time’ for the body to release and heal. And not going into fear or impatience of the head of ‘when am I going to feel better’ and so on. I have had ‘re-lapses’ of influenza A (symptoms) over the years, yet this time, it is very different. As ‘underneath’ this is coming up and out and through, a very NEW STRENGTH and ENERGY that was being ‘suppressed’ with this like ‘layer’ or ‘covering’ of ‘older’ energy in our physical bodies. Remember this is the Largest Metamorphosis that we are currently in and going through! On all layers and levels and this will take ‘time’. As we continue to honor and nurture and be gentle on ourselves in faith and trust of ALL.